And ‘consensus’ is going to hasten the destruction of Israel and get millions of Jews dead…… or worse. 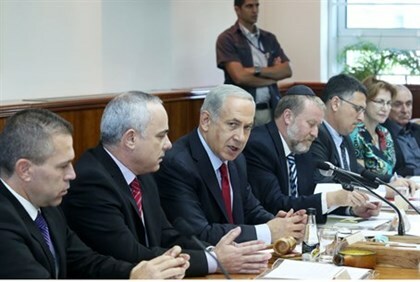 A meeting of the Israeli Security Cabinet on Monday night, in which possible responses to the murder of the three Israeli teenagers were discussed, ended without a consensus. Bibi, don’t just sit there. Lead them. The Cabinet is expected to re-convene on Tuesday morning, reported Channel 2 News. According to the report, during the discussion a dispute arose over the nature of the response. While Jewish Home chairman Naftali Bennett called for harsher measures against Hamas, other ministers opposed the move. Channel 10 News reported that Justice Minister Tzipi Livni, Finance Minister Yair Lapid and Defense Minister Moshe Ya’alon were among those who opposed a harsh response. Gaza should have been rubble by now. This entry was posted on Monday, June 30th, 2014 at 17:39 and is filed under Main Postings, The Constitutional Watch. You can follow any responses to this entry through the RSS 2.0 feed. You can skip to the end and leave a response. Pinging is currently not allowed. 7 Responses to Consensus is the absence of leadership. Ok Kenny help me with this. That bit about “Hamas will pay” was from the morning news. The post above is from the evening news…… after Israel’s version of typical Democrat Party treasonous filth got wind of – gasp – military action being planned – and played Bibi like a fiddle in the Cabinet meeting. Surprised at Yaalon not backing a crackdown on Gaza, not at all surprised at Livni and Lapid. Still think Bennet should be the next Israeli Leader after Bibi retires. I’ll keep saying it until they actually do it. Divide Gaza up into manageable slots and reopen the Philadelphia Corridor. Israel and Egypt should launch a Ground Invasion and Divide Gaza into Units. Pure evil is not ‘manageable’. I heard about this on the Joyce Kaufman show…my heart aches for these families.